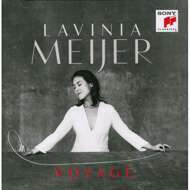 Lavinia Meyer's new album 'Voyage' is the natural response to her successful album Passaggio: Einaudi By Lavinia [MOVCL006]. She continues to explore new repertoire for the harp and chooses composers who are not just well-known by a classical audience but also contemporary composers. This is an all French repertoire album, including Debussy's famous track "Clare de Lune" and Erik Satie's "Gymnopédie 1" and "Gnossienne 1-3, 5". Erik Satie's work was a precursor to later artistic movements such as minimalism - one of Lavinia's specialties. It is the first time that music from the French composer Yann Tiersen has been recorded for the harp. He is internationally known for his soundtrack for the movie Le Fabuleux Destin d'Amélie Poulain (Amélie) which sold over 1.1 million copies worldwide .